The Westminster Abby encumbers the bodies of many famous historical figures dating back to the 1500’s. Among these historical figures include: Queen Mary I, King Henry V, Katherine de Valois and Isaac Barrow. And although many bodies are buried in the Abby, there are also memorials and sculptures commemorating other historic influencers buried outside of London. As one heads towards to the South Transept of the Abby, the Poets’ Corner featuring William Shakespeare is found. Among the other poets featured in this corner include: Charles Dickens, Jane Austen and Geoffrey Chaucer- all whom are internationally known and recognized. Today, it is no surprise to find historic poets amongst British royalties and noblemen given the Brit’s vast appreciation in the arts and literature. Although William Shakespeare is buried in his hometown, Stratford Upon Avon, there is a strong devotion to him in the center of the Poet’s Corner where there is a large marble sculpture of him leaning on books and draped in fine clothing. 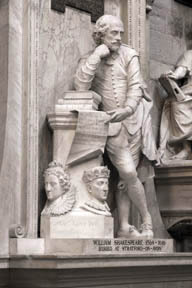 As one arm is leaning against a pile of books, the other is pointing at one of his last passages in Prospero, which is believed to be “his farewell to the world”. Shakespeare’s statue gazes right across where actor, Laurence Olivier’s tomb lies. The sculpture’s gaze symbolizes Shakespeare’s ( and the world’s) acknowledgement and appreciation of Olivier’s work in recreating Shakespearean plays.